Around the country, cash-strapped cities are facing a harsh reality: They lack the money to pay their employees, keep their schools open, and maintain public services for their citizens. 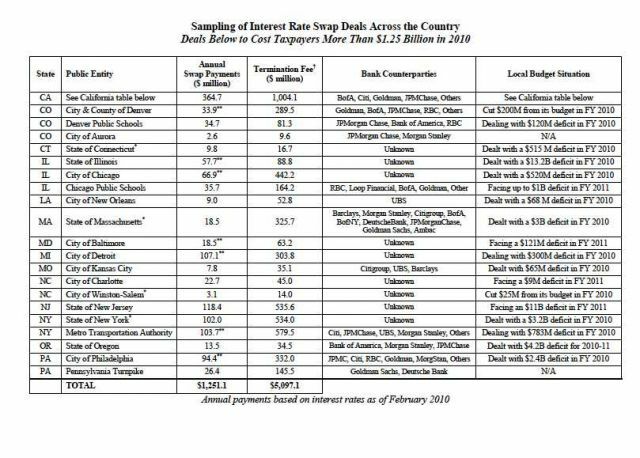 Making matters worse for dozens of metropolitan hubs are obscure, toxic deals with the world’s biggest banks called “interest rate swaps,” a peculiar kind of financial contract that provided city governments with easy cash before the crisis but has now turned sour and cost taxpayers more than $1.25 billion a year, according to a new report (PDF) from labor union Service Employees International Union. Cities like Detroit, Chicago, and Denver will in 2010 pay big banks—Citigroup, Goldman Sachs, and JPMorgan Chase, among them—tens of millions of dollars in swaps payments, SEIU found; meanwhile, those same cities have previously cut tens and even hundreds of millions of dollars from their budgets to stay afloat. “These deals amount to the biggest taxpayer bailout of Wall Street you’ve never heard of,” says SEIU Secretary-Treasurer Anna Burger. What’s an interest rate swap, you ask? Well, they’re contracts that allow, say, Baltimore to enter into a deal with Bank of America to pay for public infrastructure projects. In that deal, Baltimore and BofA will “swap” interest rates with each other: the city will pay the bank a fixed rate—3 to 5 percent, say—to borrow money, and the bank will in return pay the city cash based on a floating, variable interest rate. (This is determined by some underlying source, like the LIBOR rate for short-term lending.) The point of a swap deal is that, when the economy was booming, cities could borrow from banks on the cheap, because their fixed payment rate was on par with or better than the bank’s floating rate. But after the economy tanked, and the LIBOR rate dropped with it, banks emerged as the winners: Their variable payment rates to cities are now basement-low because overall interest rates are low. Cities, however, are still stuck with those higher fixed rates. Essentially they’re getting fleeced. Of course, a swaps deal is a contract. Cities willingly entered into these deals with the likes of Goldman and JPMorgan. There’s no doubt they’re getting screwed now, paying banks way more than they’re getting in return, but they agreed to the swaps back when everyone was binging on credit and living beyond their means. However, their citizens are the same people who bailed out the world’s biggest banks, so perhaps everyone would be better off agreeing to kill the swaps deals and go their separate ways.